"And then those limits pushed back." We learn that the browser-based MMO Glitch is shutting down next month. The team at Tiny Speck breaks the news in a frank statement that eloquently and powerfully expresses the heartbreak they feel coming to this decision; I take the expression as genuine, and not without my own source of sympathy. I accepted a friend’s invitation to mess around with the game a bit only a few weeks ago, and two things struck me immediately. First, the writing was very good, especially in terms of in-game text and dialogue. I’d also been nosing around with Guild Wars 2 at the same time, and found the contrast between Glitch’s intelligently whimsical banter and Guild Wars’ generic-fantasy blah-blah quite striking. But I could not shake the feeling that this game really wanted to live on a tablet. The colorful, 2D world with its goofy, melon-headed player-characters seemed very out of place running on a PC. This is a game that invited play as a pleasant attention drain while relaxing in a comfy chair, perhaps with the TV on, or chatting with others in the room — not sitting at one’s desk, with mouse and keyboard at hand. And indeed, Tiny Speck points to the inexorable trend towards mobile — and, by definition, away from their chosen platform of Flash — in their shutdown announcement. Continue reading "And then those limits pushed back.". I’m very happy to announce the release of Sixis for iPad. 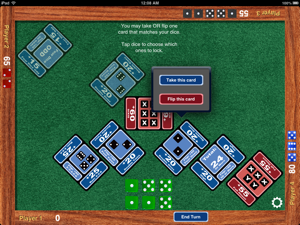 This is an adaptation of the dice game of the same name published by fellow Bostonian Chris Cieslik of Asmadi Games. I became convinced to take it up as a project after overhearing more than one smart friend independently describe the original game as “Yahtzee, except good.” That’s as good an elevator pitch as any, so I’ll just pair that with a note that Sixis works on any iPad running iOS 6, and costs US$1.99 (or your local equivalent). I still need to cut together a trailer video; a swell of day-job client work carried the chance to do that out of my hands this past week, but I can offer a sort of artist’s statement, which constitutes the remainder of this post. While the core game design is not mine, I did find myself faced with many interesting decisions while crafting this digital adaptation, and I’d like to write a bit about why I chose the paths I took. Continue reading Announcing Sixis for iPad. I happened to be visiting Portland on the weekend that the official website of the Maine Republican Party put a lot of energy into mocking Colleen Lachowicz, a state senate candidate, for playing World of Warcraft. The story became literal front-page news of the October 5 Portland Press Herald, so that the toothy green face of “Santiaga”, Lachowicz’s orcish in-game persona, grinned from within every nearby newspaper kiosk. Continue reading Santiaga for Senate. I see @fivethirtyeight has Obama at an 86% win and think about all the misses I get in #xcom when I have an 86% to hit. I find this at least as inspirational as I do humorous. Is there any better medium than games for taking a concept like “86 percent probability,” which the lazily pattern-seeking human brain is predisposed to gloss as a sure thing, and illustrating in full interactive clarity what that number means in practical application? Should Obama not win today’s election, I’d be willing to wager that, of all the people who would crow about how Nate Silver’s predictions were entirely wrong, not a single one of them would have ever played a dice-heavy tactical combat game. A question for Google people -- Usenet dump? For some fifteen years, most of the online discussion about interactive fiction -- probably most of the IF discussion, period -- happened on two Usenet groups: rec.arts.int-fiction and rec.games.int-fiction. We have archives of those discussions from 1992-1997 and some of 1999-2002. (See IFArchive directories for RAIF and RGIF.) Outside those ranges, we rely on Google and its Groups service -- as you can tell from my two links above. Google Groups has historically been iffy about Usenet. It started by acquiring the Deja News post archive (which itself only started in 1995, and was not completely preserved). Google's Groups service was then built on top of that -- rather in the sense of a rhinoceros being built on top of an old rollerskate -- and its Usenet access dwindled in priority. Its indexing was famously gappy for many years, although Google fixed that a couple of years ago. I could get into a long post about Google's treatment of Usenet and its long-term consequences, but that's not this post. My question: we, the IF community, would like to hold our own data here. What's the best way for me to get a complete dump of all messages posted to those two Usenet groups, ever? Scraping through the Google Groups web interface is a way to do this, but it's not very good, for a couple of reasons. (a) Google tends to shut down automated trawlers after some number of requests. (b) I'd have to deal with an extra layer of content encoding, which is more room for encoding to go wrong. (c) I don't know if Google's indexing is really complete, even now. So it would be way better if some nice Google person could tap it at the source and send me a tar file. Or a DVD, or a hard drive, whatever. Anybody? Obviously there's no such thing as complete. I'll take whatever Google has, and merge it with the Archive records. I think I want spam, too. Probably. It depends on how much spam there is. (Google's index lets through a lot of spam, but maybe there's a thousand times as much which it doesn't show.) Tell me if it's horrible, we'll discuss it. Original post file format, if possible. My intent is to take whatever I get, ball it up, and stick it on the Archive. Then (at some point, not necessarily soon) I will go through, cull out the off-topic trolls and spam, and post it as a nice browsable web site on the Archive. Or maybe somebody else will do that part. Collect data first; massage later. If you can help, please comment here, or email me (erkyrath@eblong.com). Thanks. Tags: archiving, if, ifarchive, interactive fiction, newsgroups, usenet.